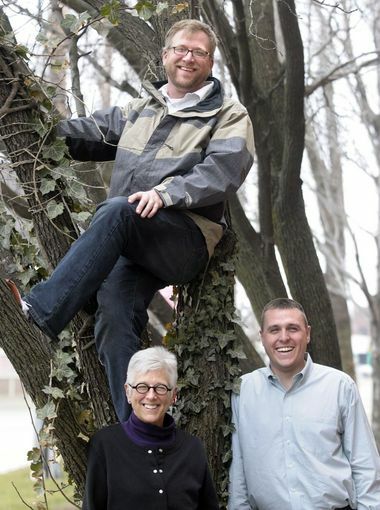 Darren Breen | The Grand Rapids PressSteve Faber (top) Director of Friends of Grand Rapids, City Forester Tyler R. Stevenson, (lower right) and Dotti Clune, (lower left), chair of Grand Rapids Urban Forestry Committee, are collaborating with Global ReLeaf of Michigan in the 21st Annual Tree and Shrub Sale. GRAND RAPIDS â West Michigan tree lovers can get deals on native trees and shrubs thanks to an event sponsored by the city’s Urban Forestry Committee, Friends of Grand Rapids Parks and Global ReLeaf of Michigan. More than 40 varieties of trees and shrubs will be available at prices ranging from $18 for lilac or hydrangea shrubs to $50 for trees such as Snow Fountain Cherry or Heritage Oak, according to the sponsors. “The Global ReLeaf is a simple and inexpensive way to contribute to a greener Grand Rapids,” said Dotti Clune, chair of the city’s Urban Forestry Committee. “When you plant the right tree in the right place, you can beautify your yard, save energy, improve air and water quality and increase the value of your property,” Clune said. Clune said the trees and shrubs also are available to non-city residents. Persons who want to purchase a shrub or tree can place their online order before April 11. Order forms are available at www.globalreleaf.org. Mail order forms are available at the city’s Parks and Recreation Department, 201 Market Ave. SW.
Orders will be available for pickup on April 30 at the Madison Avenue SE entrance of Garfield Park. Ann Arbor-based Global ReLeaf is offering bare root trees that are four feet to six feet tall. Shrubs are one to two feet tall while evergreens are two feet to three feet tall. The Urban Forestry Committee has a goal of increasing Grand Rapids’ “tree canopy” to 40 percent of the city’s land area.